We are pleased to announce that Jason Manford will be performing at the upcoming The Nightmare Before Christmas Charity Ball. 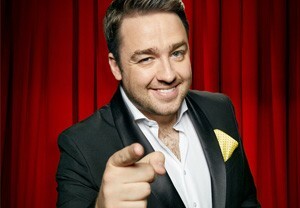 Jason Manford was born in Salford, Lancashire. He is an English writer, comedian, actor, radio and television presenter of Irish descent. He began his career in 1999, while working at the Buzz Comedy Club upstairs at the Southern Hotel in Chorlton, Manchester. Jason was collecting glasses when a performer didn’t arrive for an evening set, Jason, who was 17 at the time stepped in to fill the gap, an event which marked the beginning of his comedy career. Six gigs later he was crowned The City Life North West Comedian of the Year. He cites Billy Connolly as the first comedian he saw when he was 9 years old, and as the very first inspiration for him to become a comedian. He has a love for family friendly entertainers like Eric Morecambe, Tommy Cooper and Les Dawson. Later on comics like Jasper Carrott and Dave Allen influenced Jason, but it wasn’t until he saw Peter Kay he decided to have a go himself.